Earlier this month, I asked a few of Violinist.com's soloist friends if they would like to write about our topic for August, Celebrate Classical Music. 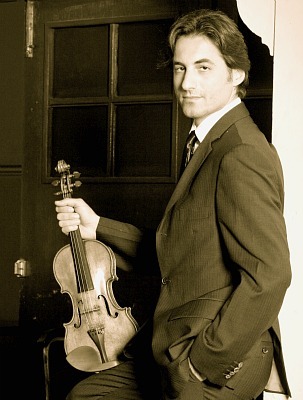 Today I'm happy to present a blog from violinist Philippe Quint, whom I've interviewed a number of times, about the Korngold Concerto; about Paganini works and about performing in Mexico. When Laurie asked me to contribute a blog to “Celebrate Classical Music,” I thought to myself: well…there is hardly anything to add to what’s been said. Then suddenly I had an enormous stream of thoughts and observations that started to accumulate, prompting me to run to the computer to write them down. Classical music has been with us for hundreds of years, and we all know how great it can be. I am saying “can be” because, even some of the great composers have had their flops, and some of the greatest music has been interpreted so poorly (even by well-known performers) that it left either little or no impression at all. Many years ago, I was in one of my music history classes at Juilliard, and the teacher offered us a so-called “free topic.” Basically, anyone could stand up and talk about anything, whether it was music- or non-music-related. During that class, we discussed everything from astronomy to math to human relationships to -- of course -- music. A colleague of mine, a student from Western Europe, quickly raised his hand and proclaimed: “There is no need for classical music to achieve the same success as the popular genres. Being classical musicians makes us a part of an elite group of true music appreciators." So my friends, here is another "free topic": Are we the elite group that knows better then everyone else? Do we want to create an alienated society that is hardly open-minded? I attended multiple performances of classical concerts, ballets and operas. I obsessively read books and watched the three available Soviet channels that had a slew of Soviet Presidents, which changed once every six months. After my arrival in the United States in 1991, and upon acceptance to Juilliard, I continued the path of strict Classical Music training, entering multiple competitions and sneaking into every possible concert at Avery Fisher and Carnegie halls. I also bought the unaffordable-to-me-at-the-time records of my favorite performers. Classical Music was my life. But the competitions did not support my hopes of sudden, overnight success, and the music business world was deaf to my attempts to become a concert violinist. That’s when frustration kicked in. What to do? Do I succumb to the more popular genres like “crossover,” or do I just simply quit the violin and find myself another profession? The recent movement at the time -- so-called “house music" and DJ’s that came with it -- had millions of fans worldwide. That kind of popularity is rarely seen with Classical Music and musicians. So who cared about Classical Music and Artists, if we couldn't reach the younger generations? I contemplated quitting, and I even stopped playing for several months in the mid-90s. During that time, I arrived at some interesting conclusions. First: It is easy to get lost in this world, but what remains important is being true to yourself. Also: Classical music is not about popularity, and it does not need to be equated to any other music genre. It is simply in a class of its own and requires one important aspect – LISTENING. It’s a complex creature, with many layers of colors and structures. Even so, I hardly think that we are an elite group of true music aficionados, with a closed, small, unwelcoming circle of like-minded individuals. Rather, we sometimes simply lack the ability to properly introduce classical music to the world. The good news is that now, more then ever, I feel that we have a number of wonderful ambassadors who have been actively changing the perception of classical music. These visionaries pop up once in a while, and they take the initiative to tastefully stretch the boundaries and move things forward. Even when sometimes I am not touched by something innovative – I always appreciate the effort. I know how much work it requires, and in a long run, we really don’t know how a new idea may further develop and improve. One life motto I have established is that I do not want to ever look back and regret that there was something I was curious about and did not try. While still at Juilliard, I suddenly wanted to try the “forbidden” world of “other” music. And I did. I collaborated with interesting “outside of classical music” artists, composed some original music, and explored different styles. What I found was that all music worlds have their pros and cons. Choose the art form that speaks to your heart. There is no reason to praise or dismiss any style or movement, simply because of your friends' opinions or because of the media's influence. It is important to do your own research, so that you can make your own judgments about art forms that are yet-unknown to you. Perhaps you'll make a fascinating discovery. I find one of the most ridiculous discussions today is the frequently-mentioned idea that Classical Music is dying. Come on people – don’t be silly! It’s like saying that Louvre Museum in Paris will be closing because the paintings of Da Vinci, Rembrandt and Michelangelo are now out of fashion and too old to attract any more interest. Great art will find ways to survive and prevail over time. I love Classical music and can’t imagine my life being without it. Your writing connected with me, and we are no where even near each other, either in location or life experience! You write about such universally heartfelt issues in a way that had me nodding my head in agreement as I read. Thank you so much, Phillipe! The picture alone says it all. It is this passion that drives most musicians if not inspire. With respect, you have not really said anything new. But to remind us all is in itself not a bad thing! The term "classical" comes from the term "class", so what is a "class" anyway ? This is a rather complex topic to discuss here in few words, but for purposes of this blog, any expression of art for which a consensus exists about its inner beauty forms or belongs to a "class" in itself, meaning that this expression of art has become clearly and distinctly distinguishable from other kinds of aesthetical manifestations. A musical composition becomes truly "classical" mainly as a consequence of its beauty ... a splendor beauty so great that transcends time, space, culture, language and even its own creator. Its inner beauty is such that it becomes a patrimony of humankind. All the geniuses that composed music that became "classical" were not aware that they were composing "classical music"; this is a term that we use "after the fact". In this sense, it is unfair to consider "classical" a mediocre composition even if it was written by one of the "greats" and following this line of thought, "Yesterday" from Paul McCartney has become a classical composition (sorry Phillippe! ).